Dhindo or Dhido (pronounced dhee-dough) sounds like some exotic dish from Nepal, but it is simply a thick porridge or mush, made by cooking stone-ground cornmeal (ghatta maa pidheko makai ko pitho), millet flour (kodo ko pitho) or buckwheat flour (phaapar ko pitho) with salt and water. Dhindo has been a staple food of most rural and middle mountain-area people of Nepal, especially in dry areas where rice or wheat corps are difficult to grow. This hearty and filling dish is a nutrient powerhouse and is often eaten with a dab of homemade butter or clarified butter (nauni, gheu), curried vegetables (jhol tarkaari), or with various pickles, buttermilk or yogurt. Gundruk-Dhindo is the most common combination served in farming communities. Gundruk is a fermented and preserved leafy vegetable that is used to prepare a soup like dish that is known as gundruk ko jhol. Traditional dhindo meals are served on typical Nepali round plates called thaal made of stainless steel or brass with small bowls. Nepalese people who do hard physical labor consume enormous amounts of this nutritious meal. It is very common to see a large mounds of Dindo served in the middle of thaal accompanied by side dishes in small portions. It is eaten with the right hand by first scooping up or tearing small bite-size pieces of dhindo with your fingers, then dipping or rolling into the sauce before you put in your mouth. It is a Nepali tradition to always wash hands prior to eating and after the meal. Dhindo should be eaten steaming hot, right after cooking since it hardens once it cools. Traditionally dhindo is cooked in a Nepali iron pan with long handle and rounded bottom, called a taapke, which has an excellent heat distribution qualities. It is typically stirred with a large iron spoon with a long handle (panyu). As a humble origin, Dhindo meal were rarely found in fancy Nepali restaurants of Kathmandu, but these days, in many modest neighborhood restaurants, dhido is being introduced as most authentic and traditional Nepali meal. A very flavorful and healthy meal from rural part of Nepal and the dhindo is made out of millet flour (kodo ko pitho). Served with dhindo is rich and flavorful chicken curry cooked with ginger-garlic and fresh green chilies, salad-like gundruk dish (saadheko gundruk), tiny bits of red chili sauce, and sauteed onions. For someone with simple tastes, nothing could be more satisfying than kodo ko dhindo. Another steaming dhindo dish prepared with buckwheat flour (phaapar ko pitho). It is served with a flavorful array of side dishes in small bowls (kachura). 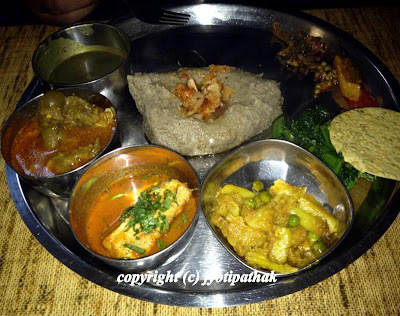 They include starting from the back to the front: black gram daal (jhaaneko kaalo maas ko daal), goat curry (khasi ko ledo), fish curry (maachaa ko jhol), cauliflower & peas vegetable (kauli re kerau ko tarkaari), mustard greens (rayo ko saag), and pickled radish. The warm clarified butter (ghue) is lightly browned with chopped garlic before pouring in the prepared dhindo to give an extra flavor. Here is my simple and basic step-by-step method of cooking corn flour dhindo. ... Once the water comes to a full boil, stir in the cornflower in a slow, steady stream with the left hand, while mixing vigorously and constantly with the right hand. Mix well until well-combined, making sure there are no lumps in the mix. Constant stirring will avoid any lumps. This process is called बेस्करी ढिडोँ मस्काउने (beskari dhindo maskaaune) in local terms, means vigorously stirring and turning the thickening mixture. Reduce the heat to medium-low and continue stirring until dhindo thicken, and the mixture has lost its grainy texture. Be careful the mixture pops and spatters and the bubble can burn the tender skin. Dhindo is ready when the porridge starts separating from the side of the pan. The mixture should be moist, neither runny, nor dry. Remove from heat, stir in clarified butter, and whisk until mixed well. Pour steaming dhindo directly onto the plate or thaal and eat piping hot. Taste our traditional Nepali dhindo set - a perfect introduction of Nepali cuisine - corn flour dhindo (makai ko dhindo) served with (far left in a bowl) chicken with gravy (kukhuraa ko maasu ko suruwaa) - featuring local chicken raised in the farm, and (front) - sprouted 8-bean soup (kwanti) in a bowl. In the brass thaal served with the steaming dhindo - tender mustard greens (raayo ko saag), stir-fried cabbage (banda-govi ko tarkaari), plain yogurt, fiery tomato chutney (piro golbheda ko achar) and few slices of cucumber and daikon radish. When it comes to Nepali food, you will have to say good bye to your fork and spoon. Be authentic and use your right hand to enjoy the meal. From my daughter's kitchen - if you have a lot of leftover dhindo, pour the remaining mush into a plate and smooth it out. If you allow the dhindo to set, it will start to thicken and solidify. You can cut into square or rectangular pieces, then fry in butter, or top with cheese, or add any other flavorings or sauce and serve. Capturing the image of food sign (hand-written) - on the road between Namobuddha Monastry and Dhulikhel, Nepal - Featured on the Menu are offering of home-made Nepali authentic food made to order - Buckwheat Dhindo, Gundruk pickle, Nettle greens, Daal, Cornmeal Dhindo - will make according to order - Bada No. 9, Pipal ko Bot area - I wanted to check out this place and peeked inside the small house across the road. I found a small village kitchen with wood-burning clay stove (chulo), empty pantry with no owner or customers. Tasting regional flavor of dhindo in the local restaurant called "Pate Dhido" - The kitchen staff starts preparing dhindo immediately after they receive the order from you. I smelled the dhindo being cooked in their kitchen from my table only few feet away. I quickly got up and requested the cook to let me watch his method. It was being cooked in a centuries-year-old way by using a copper pot and a wooden spoon. 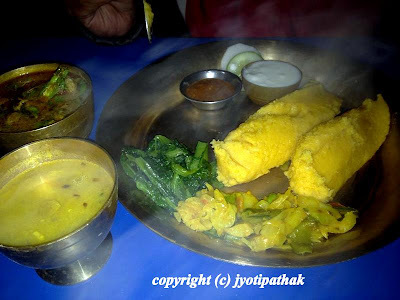 If you are looking for an authentic dhindo meal place outside Kathmandu, head to this place called "Pate Dhindo" restaurant, Thumsi - a popular stop for the passing travelers, located near the busy neighborhood of Narayan Ghat-Bharatpur-Chitwan area. Don't be fooled by the rugged exterior of this place, the sign is all faded and needs to refinish but the inside is clean and welcoming. After vigorous stirring the mixture in the copper pot, the fatfatee cook (chatterbox-फतफते) looked at me and told me, "look you can't avoid the messy splatters when you are stirring the mixture (ढिडोँ लाई मस्काउदा). The buckwheat and the millet dhindo is also pretty much cooked the same way except the color of the finished dish will be a little different. The taste of dhindo is usually bland, so it is always eaten with spicy liquids.....oops..the dhindo is ready now"... and he poured the steaming mush in a brass plate. Shelves full of Nepali bhaadaa-kudaa (Nepali utensils) line the wall at the cozy restaurant. Serving dhindo in a brass plate - traditionally Nepali meals are served on a thaal-kachaura. A number of small bowls, known as kachaura, are placed on a round tray. Meat, vegetables, and daals are placed in the bowl, while rice, bread and dhindo are placed directly on the middle of the tray. This way the rice or dhindo does not get mixed up with other dishes and lets you sample each individual dish separately. We were presented with a traditional thaal of dhindo made with makai ko pitho (corn meal) – I did not know the freshly cooked steaming dhindo could be so good. I enjoyed every bite – served in simple natural form. Thanks to the freshest locally grown raayo ko saag (mustard greens) sauteed with dried red chilies, and the local chicken with spring onions. The pickle platter consisted of fiery tomato chutney and khaadeko mula ko achaar (pickled radish). Picture of the most satisfying phaapar ko dhindo, (buckwheat) I ever ate at Pokhara Thakali restaurant. What better way to get a taste of Nepal! 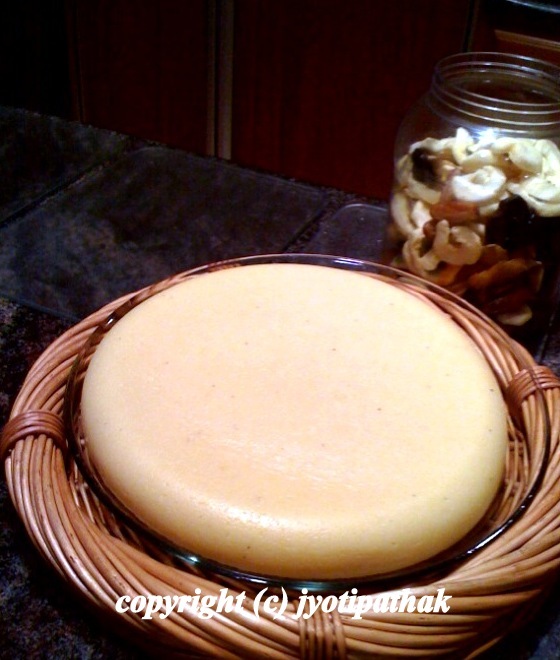 From another blogger, Gary Fleener - Nepali Polenta - Roadhouse Style, please click here. How to make Dhindo from "We all Nepali", please click here. Off-road rambles and stomach rumbles by the Narayani - Nepali Times Blog - please click here. 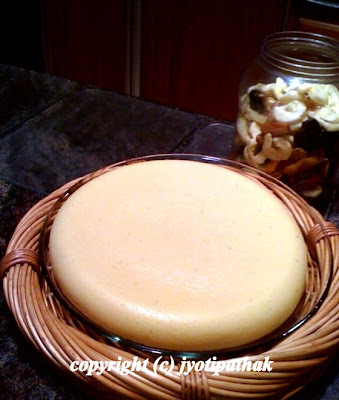 From another Blogger, Sunita Giri - Shades of Life:Polenta, please click here. Saag and Dhindo - YouTube - please click here.